This is the first part of Mikhail Khodorkovsky’s first interview after his pardon. Black polo neck shirt, jeans – a change from the prison trousers, a gray “hedgehog” [short prison haircut], glasses in thin frames, a marked stoop, and on the whole, it is visible that 10 years of prison and labor camps hardly foster the maintenance of your figure and white-toothed smile. 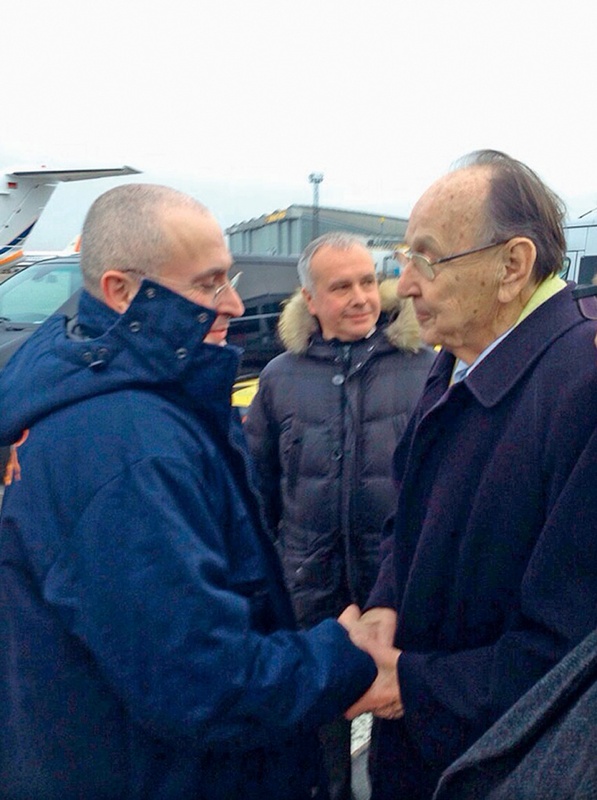 He left the labor camp with two bags of papers, and he was given a coat in exchange for his labor camp jacket and hat at the Pulkovo airport before flying to Germany. He was offered to change his trousers for some Aeroflot pants with reflectors on them, but refused. When he described everyday life in labor camp, he uses the present tense, and you realize: this is still his life. And only the five-star hotel in the center of Berlin at the Brandenburg Gate, hundreds of reporters at its entrances, the one-and-a-half room suite (everything is heavy and substantial in the German style) and the letter on the table with his name on the envelope from German President Joachim Gauck remind us that the interview is being given no longer by a zek [prisoner] but Mikhail Borisovich Khodorkovsky, a person whose name is in all the world headlines. He gave his first interview in freedom to The New Times, where he has been a columnist for several years. Yevgeny Albats: How did you sleep that first night in freedom? Mikhail Khodorkovsky: I didn’t. Terrible – I woke up about 3:00 am. YA: And how does a normal bed feel instead of the racks you slept on for 10 years? MK: No, not 10 years – I had family visits three times, where there are normal beds. But imagine, all of those things completely didn’t touch me. YA: From the labor camp, you didn’t come home to Korallovo, where your mother and father were waiting for you, nor to your Moscow apartment, where your wife Inna and children were waiting, but you flew to Germany. What is this: exile in exchange for forced labor? MK: I can’t rule out the fact that I would have had to go abroad to Berlin anyway at some point for reasons you know [his seriously ill mother, Marina Filippovna—Ed]. And that seriously influenced the taking of the decision [by Putin—Ed] . If my mother had had the prospect of being in Moscow, I think – this is my supposition – that Vladimir Vladimirovich [Putin] would have made the decision with great difficulty. But the fact that I had to fly to Berlin, and I was aware that I could fly to Berlin only once, like now, and if I return (to Russia) they might not let me out of the country again, because there are formal reasons which they could seize on – in short, I think that made it easier for Vladimir Vladimirovich to make a decision about my pardoning. YA: Was emigration — even temporary — a condition for your release from labor camp? MK: I cannot say that it was a condition. It was what eased, enabled the taking of the decision about pardoning. And when they write now that some representatives of the intelligence agencies came to the labor camp, and I asked them some idiotic questions about which they are writing now – none of that happened. Because Vladimir Vladimirovich and I know each other far too long. And we don’t have to pronounce excessive words in order to get an answer that is a priori readable and understandable. YA: How did it happen? MK: My lawyers conveyed to me that the decision on pardoning may be made. And that admission of guilt as a condition of release was not put in front of me. This was a key problem beginning from the Medvedev era. Back then Medvedev said that he was prepared to pardon me, but Putin or someone from Putin immediately said that for this, an admission of guilt was necessary. For me, it was absolutely not critical to write a request for pardoning. The court (in the second case) was a farce, and everyone understood that perfectly well. To reply to one phony paper by writing another phony paper – I would not feel any moral discomfort from that. The government and I exchanged phony papers, and the government understands that, and I understand it. And they understand that I understand, and I understand that they understand. On the whole, we have complete transparency. But in this phony paper, there was only one non-phony problem (I mean back in the Medvedev era) – admission of guilt. Because as soon as I write that I acknowledge guilt, a whole bunch of people I respect end up in a very difficult situation, virtually any person who used to work at YUKOS then becomes vulnerable. I don’t have to explain to you how they trump up an “organized group.” Therefore this issue was not discussed by me. I was prepared to write anything at all in a phony paper, even about space ships that plow the vast spaces of the Universe. But the admission of guilt would have had quite concrete consequences for a very wide circle of people whom I simply cannot let down. This time they told me; you don’t have to write an admission of guilt. MK: 12 November. I was told that I had to mention the situation with my mother as well. I naturally couldn’t lie, but this was a real situation, I had written about it. Well, and that was it; I submitted it. I understood perfectly well that there were two options – either a third case, or I would be released. YA: And they did not set any terms for you; for example, you can’t be involved in politics, you can’t finance the opposition, you can’t say a single good word about [Alexey] Navalny and so on? MK: No, there weren’t any. I wrote in my paper about what I had said publicly many times; I do not intend to get involved in politics and do not intend to fight for the return of the shares (of YUKOS). YA: [Igor] Sechin may not expect lawsuits from you? MK: I have spoken of this many times, and if I said it once, then very weighty reasons would have to appear for my decision to change. There aren’t any weighty reasons. And yes I asked that I be given the opportunity for travel abroad. The problem is that back then, on 12 November, my mother was in a hospital in Berlin. Fortunately, two weeks ago, the doctors told her that she could return to Moscow for three months, and then come back to Berlin. Thank God, they gave her that break. But then as a result it happened that we missed each other. YA: And did you know that she was in Moscow? YA: And you understood that you were not to travel to Korallovo? MK: Yes. Thus I ended up here in Berlin, but they – my parents, wife and children – were in Moscow. But there were no other options. Our government honestly may say that they did not exile me, and that I asked for it. And knowing our realities, we can absolutely precisely understand that they asked me to leave the country. In the current situation, understanding all this, I went for it. Because this subject (my mother’s illness) is too serious. But if I would have had to let down people, I wouldn’t have left. When my lawyer asked me; but if they will still nevertheless insist that you sign an admission of guilt, I said – well, that means nothing will come of it. If I would have written an admission of guilt in such a situation, then my mama would not have let me back home. I could care less about all the rest. YA: Tell us about the statement that you wrote; how did it look? MK: The official application for pardoning is virtually one line: I ask to release me from the further serving of my sentence since I have already served 10 years out of 10 years, 10 months in prison. That’s it, period. Besides this, there was also my personal letter to Putin, where I wrote about what I just told you, about the situation with my mother. YA: And how did the zek Khodorkovsky transmit a letter to Putin in the Kremlin? MK: That actually was not a problem at all. I gave the letter to my lawyer, and in fact the administration of the colony could see what I wrote if it is wished. There is video surveillance. And my lawyer sent the letter to Mr. [Hans-Dietrich] Genscher [the German minister of foreign affairs from 1974-1992—Ed]. Then to whom and specifically how Mr. Genscher transmitted it, I don’t know. From the perspective of a picture, it was stage-managed. If somebody wanted to make a movie about the 1970s, the exile of a dissident, you couldn’t have thought up something better. MK: It’s also a mystery for me. But you know, sometimes there are such positive mysteries. What a certain miracle happens, but you don’t know the reasons for that miracle. YA: This isn’t bargaining for you between Merkel and Putin, where you are like a kind of ace? MK: No one told me anything at all about this. YA: And if you are allowed to return, you will return to Russia? YA: People have already started saying that oh, Khodorkovsky will go to the USA, he doesn’t intend to return. MK: So, once again: Mr. Peskov said that I can return any moment. MK: He personally, I heard…But from the objective perspective, I will return only in the event that I will be certain that I can leave if necessary. In my current family situation, that’s the main condition. 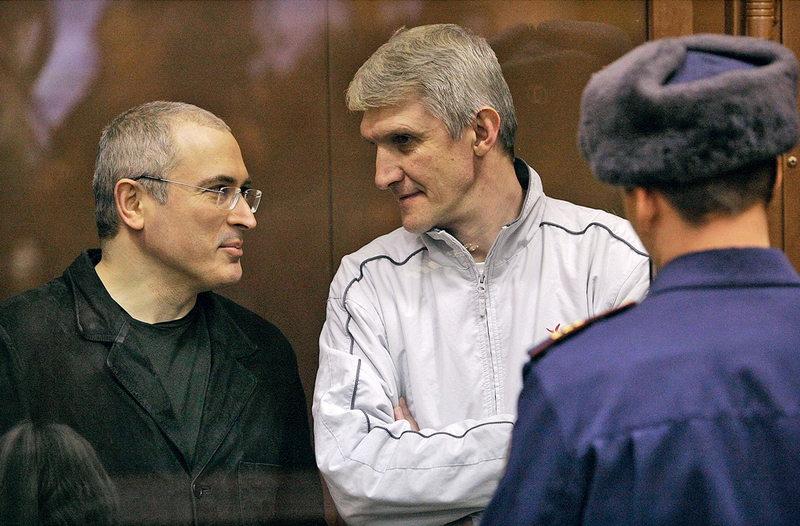 Mikhail Khodorkovsky and Platon Lebedev in the courtroom, Moscow, December 2010. YA: How did you learn that the president of Russia had decided to pardon you? MK: At first I heard over the radio what Putin had said of the third case. Of course that very much gladdened me, because to be honest, I had thought that another 15 people would then weigh on my conscience. When I heard that there would be no third case , a weight was lifted from my soul. What he said at the end (about how he was prepared to pardon Khodorkovsky) was said over the radio. Then the television was turned on around six o’clock and then we heard all that. I realized then: the decision was made. And I realized that everything would be decided in a matter of days because they were trying to take me out of labor camp quickly. I immediately said to the guys: people, the journalists from Moscow will take a day or two to get here, the authorities fear that, they don’t need that at all. Long story short, I go and immediately put my papers together in order to bring them out. YA: And what was the reaction of the labor camp, of the guys? MK: Well. Anyone who believed that it was possible for him…because for speaking to me people had problems…whoever considered it possible, who wasn’t afraid of problems – they came up and congratulated me. This was the kind of camp where people only addressed me by my name and patronymic. YA: And how did they congratulate you? How do people in labor camp say this? YA: And there was no paper whatsoever? YA: And there was no convoy? MK: There were two people with him, his assistant and a formal convoy officer. YA: Was he alone or with those two young fellows? 20 December 2013. Schoenfeld Airport outside of Berlin. Just-released zek Mikhail Khodorkovsky and German politician and West German Foreign Minister from 1974-1992, Hans-Dietrich Gensher. Exile or return home? YA: She didn’t recognize you? MK: She didn’t recognize me, and second, she thought I was an officer, because they all have the same short haircuts. So we reached the plane in that car. Right up to the air strip. I boarded the plane. It was a TU-134. It had a normal interior, it was clearly somebody’s plane. MK: Well, I don’t think it was a private plane, I think it was a company plane, either from the Federal Corrections Service or from somebody else. YA: But were there passengers on it? MK: There were no passengers, there were two escorts. They said, our job was to accompany you to St. Petersburg, a plane will be waiting for you there. I said, good. YA: Did they give you some kind of documents? MK: So, the passport that they made for me in the colony, to be honest, I forgot it. I told the head of the department, he said that he would give it to my lawyer. We arrived in St. Petersburg, and they said, these guys who had been flying with me said, “here’s your passport.” And they gave me a foreign passport. I had to sign it. I signed that passport then. YA: This was at Pulkovo? MK: Right on the plane. And they said, “Give us this passport, and we will put your departure in.” They took the passport, went off, stamped the departure, returned the passport with the departure from the Russian Federation. And I sat in the plane and waited. YA: And you didn’t say to them, my mother and father are outside of Moscow. My wife Inna is in Moscow, my children are all in Moscow, where are you taking me? MK: Zhenya, well, who was I supposed to talk to? YA: And you knew that you were being sent out of the country? MK: Well, of course, what, am I an idiot or something? YA: Did they tell you that they were exiling you? MK: In 10 years, I learned to understand perfectly who had what authorities and who made decisions. Only one person makes decisions about me. And has for all of these 10 years. One man. All the rest within the limits of these global decisions can add or subtract five kopecks. Talking to those people was possible only in the event that there was a wish to make a scandal, and in fact make a scandal exclusively for one’s own satisfaction. I don’t get satisfaction from pointless discussions. MK: I didn’t know anything, but I had a fairly good guess. YA: Did you realize it was Germany? MK: Of course. We flew to Pulkovo, we sat in that TU-134 for several hours, waiting, until another plane arrived. YA: Did they feed you there? MK: Zhenya, if they asked me ten times during some transport if I wanted something to eat or if I needed to go to the toilet, that meant that the transport lasted less than an hour. No one violated any silly rights regarding me ever. The violations were always in the larger scheme. But on the small stuff, thank God, they only fulfilled the law. We sat and chatted and then the Cessna arrived and I was escorted to it. YA: This was a private plane, as Genscher told journalists? YA: From the labor camp? MK: Yes, from labor camp. We had a barter. And then I got into that plane, and there the pilot told me that Mr. Genscher had sent this plane and we would be in Berlin in two hours. From the perspective of a picture, this was stage-managed. If somebody wanted to shoot a film from the 1970s, the exile of a dissident, they couldn’t have thought it up better. There was a strictly stage-managed exile: the van was driven right up to the hatch of the plane, several people who had been hanging around with serious expressions on their faces handed me my passport on the tarmac…And we parted.